Background: Hepatitis B is an acute systemic infection caused by Hepatitis B virus. It is transmitted through direct contacts and iatrogenics. Health professionals (laboratory technicians, nursing staffs, medical professionals and surgeons) are most at risk population for Hepatitis B. This study was conducted during January 2010 to May 2010, to examine Hepatitis B prevention practices among nursing students. 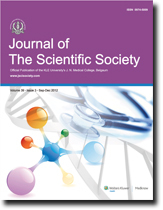 Materials and Methods: A cross-sectional study was conducted in five randomly selected Nursing Colleges (out of total 16 Colleges) of Kathmandu, Nepal. All 385 students studying in Proficiency Certificate Level (first, second, and third year) nursing were the participants. Data were collected by interview using structured questionnaire and an observation checklist was filled. Data were analyzed by SPSS (version 13). Descriptive and inferential statistics were applied; results were presented in tabular and narrative forms. Results: All participants were female (mean age 18.54 ± 2.01 years). About 39.5% participants were studying in 1 st , 31.7% in 2 nd , and 28.8% were in the 3 rd year. Almost all (97.7%) were unmarried and 87.5% were Hindus. About 96.4% participants heard about Hepatitis B and Radio/Television (83.6%) were common sources of information. Almost all (99.7%) reported; vaccination followed by avoidance of needles sharing (93.5%) is the most effective preventive measures. Three-quarters of the participants were vaccinated against Hepatitis B and 12.2% tested their blood for Hepatitis B. 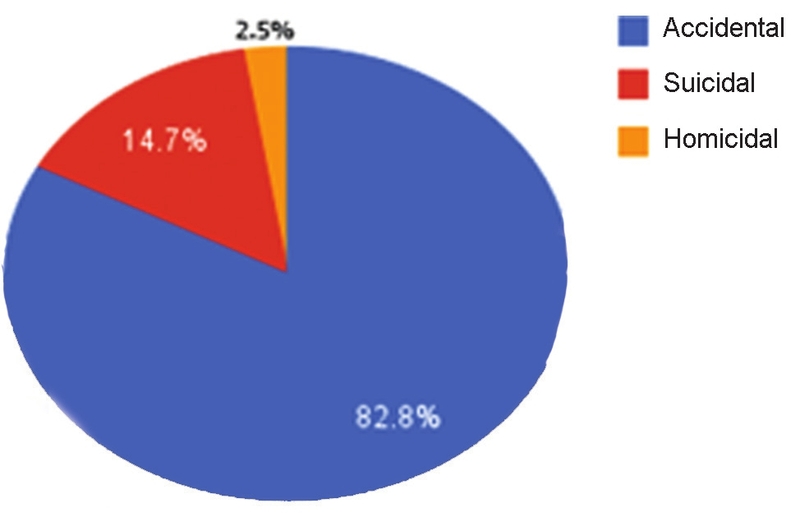 About 96.4% participants avoided the sharing of needle after using syringes after patient care, 82.6% used sterilized instruments, 81.8% used gloves, and only 27.2% used mask during patient care. Conclusion: Only two-thirds of nursing students had good Hepatitis B prevention practices, a quarter of the participants were not vaccinated against Hepatitis B, and rather poor practice of using mask during their service time skill imparting trainings and supervision of the practices are recommended for good prevention practices. Background and Objectives: Fractures of humeral shaft account for approximately 3-5% of all fractures. Most will heal with appropriate conservative care, although a small but consistent number will require surgery for optimal outcome. The aim of this study is to assess the results of humeral shaft fractures with dynamic compression plate (DCP). Materials and Methods: This is a prospective study of 35 cases of fracture shaft of humerus admitted to Bapuji Hospital and C.G. Hospital attached to J.J.M. Medical College, Davangere, between October 2005 and September 2007. Cases were taken according to inclusion and exclusion criteria. Results: In our series of 35 cases, there were 31 men and 4 women, with average age of 42.5 years. Twenty-six (74%) cases were admitted due to road traffic accident and with slight predominance of left side. Of 35 cases, 4 (11%) were proximal third, 28 (80%) were middle third, and 3 (9%) were distal third. 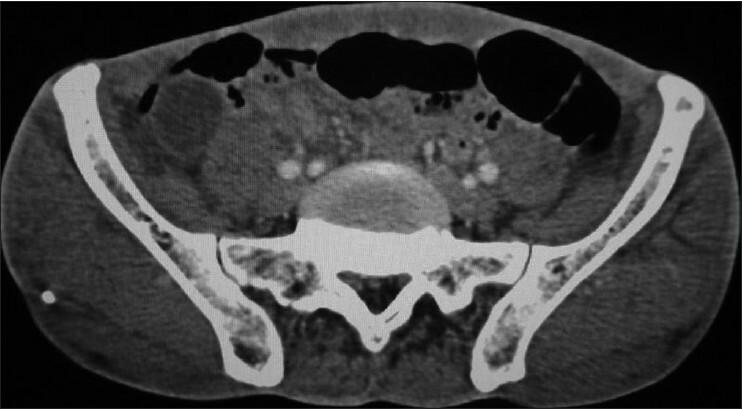 Transverse or short oblique fractures were most common, that is, 18 (51%) patients. Eleven (31%) cases were having associated injuries. 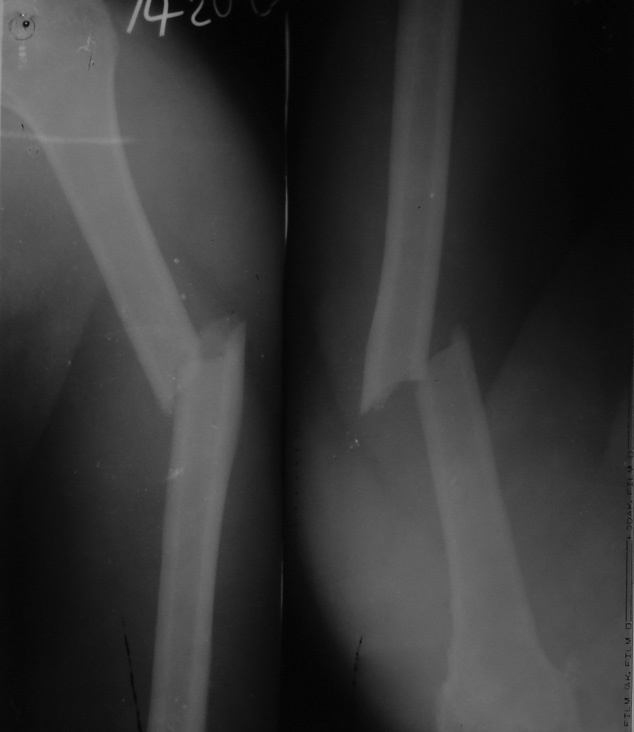 The fractures united in 33 (94%) patients with 2 (6%) cases going for nonunion due to deep infection in one, in other case may be due to immediate weight-bearing activity done by the patient. There was one (3%) case of delayed union, which united after six months. Good or full range of mobility of shoulder and elbow joints was present in 32 (91%) patients with 3 (9%) patients having stiffness of shoulder and elbow joint. Conclusion: Internal fixation of the humerus with DCP achieves higher union rates and comparable better results as compared with other modes of treatment. Aims and Objectives: To compare the frequency of complications of laparoscopic repair of incisional hernia between polyester and Polytetraflouroethylene meshes. Materials and Methods: This study was conducted as part of an Interventional multicentre trial at the Rehman Medical Institute Peshawar, Peshawar Institute of Medical Sciences and Pakistan Institute of Medical Science Islamabad from the 1 st of October, 2008 till 30 th September, 2011. The frequency of complications was calculated as the measure of comparing two commercially available meshes for the laparoscopic repair of incisional hernia using the Intrperitoneal placement of mesh (IPOM) technique. These patients were admitted via the out-patient department and their demographic data was collected on a proforma. The size of the defect was evaluated clinically or radiologically and if >10cm were excluded from the study. Forty five patients were alternately placed in either group and group I comprised patients with a ventral hernia that was repaired with composite polyester mesh (Parietex R ) whereas the other group was also repaired laparoscopically but repaired with a Polytetraflouroethylene (Dual R ) mesh. All data was collected on the individual proforma of each patient and was loaded on the SPSS R version 13.0. Results: The BMI (body mass index) in both groups was similar ( P = 1.41). The mean hospital stay was higher in the Polytetraflouroethylene (PTFE) mesh group but the values were not significant ( P = 1.12). No peri-operative death was observed in either group. Five patients (11.11%) from group I were re-admitted with varying complaints and were diagnosed as having sub-acute intestinal obstruction ( P = 0.04). A higher but insignificant recurrence rate was observed in the polyester group over a one year period of follow up. Four patients (8.8%) that were diagnosed with recurrences in group I. Instead the PTFE group had a lower recurrence ( P = 0.91). Conclusion: The frequency of recurrence was similar in both groups. A higher frequency of intestinal obstruction was observed in the polyester group. Objectives: To evaluate the relationship between symptoms, clinical severity, neurophysiological characteristics with median nerve cross-sectional area (CSA) at the level of carpal tunnel inlet at ultrasonography (USG) and its utility in diagnosis of carpal tunnel syndrome (CTS). Materials and Methods: Prospective study of 30 patients with symptoms of CTS, attending to the Neurology out patient department (OPD) at University Teaching Hospital. 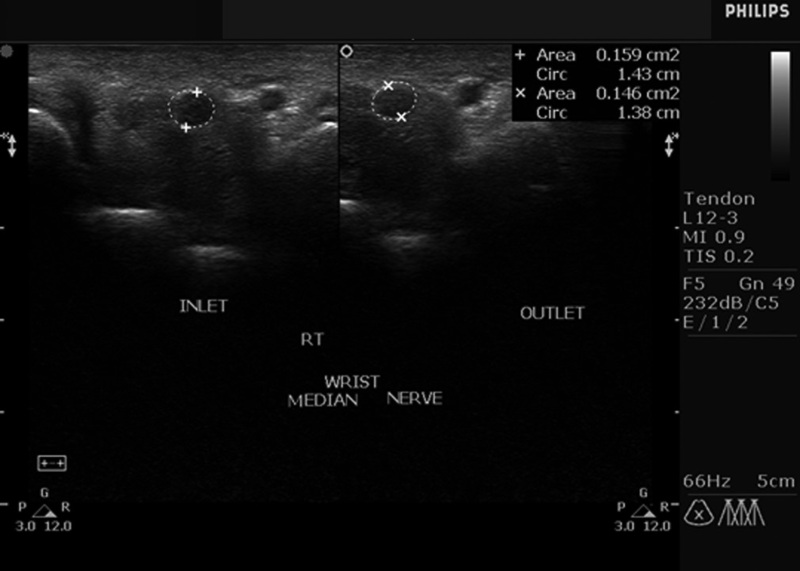 A multidimensional assessment of CTS was done using historic and objective scale (Hi-Ob scale) for clinical severity, Boston carpal tunnel questionnaire (BCTQ) for patient-oriented measures, neuro physiologic studies of median nerve at wrist and USG to measure median nerve CSA at carpal tunnel inlet. Results: Thirty patients included in the study (22 women and 8 men). Mean of CSA was 12.69 mm 2 (SD2.67). Association between BCTQ score value and inlet values was assessed by Karl Pearson correlation coefficient ( r = 0.376, P = 0.04). There was positive association with BCTQ scores and CSA of median nerve at carpal tunnel inlet. To compare clinical severity scale (Hi-Ob) and USG CSA, analysis of variance was performed (F value) and Scheffe's multiple comparison test was used to find group difference (grades 1 and 2 P < 0.001, grades1 and 2P P < 0.001, grade 2 differs with grade 2P P < 0.006). As the number of patients is less in minimal, mild and severe groups, the difference between neurophysiological groups and mean of CSA was not statistically significant. Conclusion: A positive correlation exists between USG findings and all the conventional measures of CTS severity. Background: Burn injuries rank among the most severe types of injuries suffered by the human body with an attendant high mortality and morbidity rate. In previous studies, incidence, severity and deaths due to burn were found higher in young married women in India. Study to find out mortality pattern in burn patient was not carried out in this part of country. Objective: To identify demographic and sociocultural factors, type, modes, causes and risk factors for burn injuries and their gender-wise association. Materials and Methods: It was a retrospective study. Data were collected from all burn patients who admitted and died while on the treatment from 2004 to 2009. A total of 586 patients were included in this study. Data were gathered from hospital records and entered in the excel sheet. Analysis of data was done by using SPSS version 17 statistical software. Results: The mean age of patients was 22.66 years (range 1 m to 80 years). Episodes of burn were 4.63 times common in female (82.25%) than in male (17.75%). It was statistically significant in females of age group 21-30 years (93.93% vs. 15.33% P < 0.0001). Married females (86.80%) burned more commonly than married males (13.19%) P < 0.0001. Flame burn was the major cause of death (95.56%). Kerosene was the most common (69%) source of flame burn. Clothes caught fire while working on Chullha were 25% cases ( P < 0.0001). Accidental (86.44%) burn was the most common intention of injury. The majority of burn deaths (68%) occurred within one week of the incident due to septicemia (57%). Conclusion: Factors associated with an increase in mortality were accidental burns, burn size, young age, married women, and flame burns. For planning and implementing prevention programs, the approach has to be multidisciplinary and coordinated. Histoid leprosy is a distinct variant of lepromatous leprosy. It presents clinically as well demarcated cutaneous and subcutaneous nodules similar to dermatofibroma. A 40 year old male, presented with multiple progressive skin lesions on buttock, trunk, face, back and extremities of six months duration. 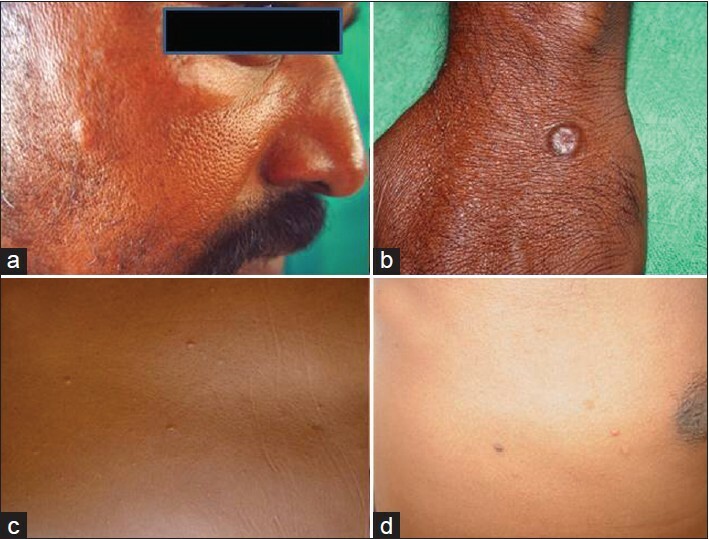 Examination findings revealed multiple, irregular, bilateral, symmetrical shiny cutaneous nodules over the above mentioned sites. Radial, ulnar, radial cutaneous and lateral popliteal nerve thickening was seen. 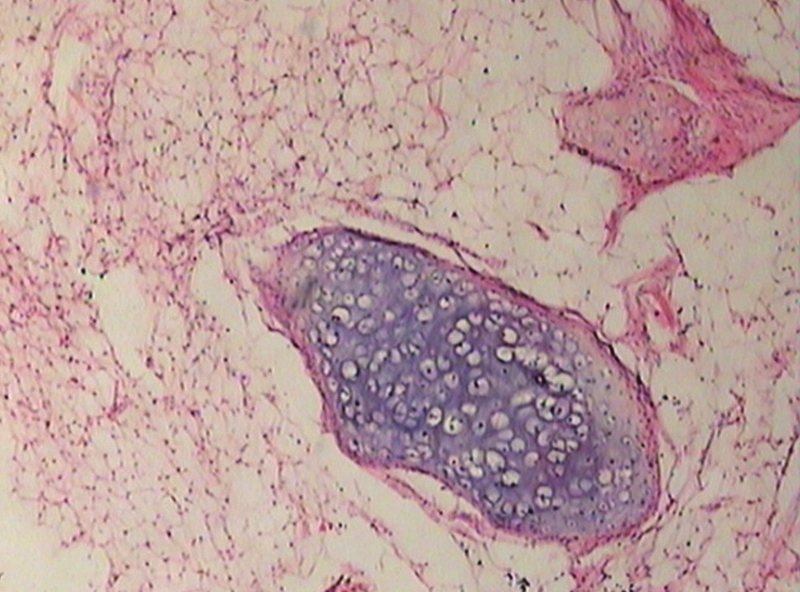 Fine needle aspiration cytology (FNAC) showed features of histoid leprosy, which was confirmed by histopathology. Modified Ziehl-Neelsen stain for Acid fast bacilli was positive. Bacterial index was 6+. 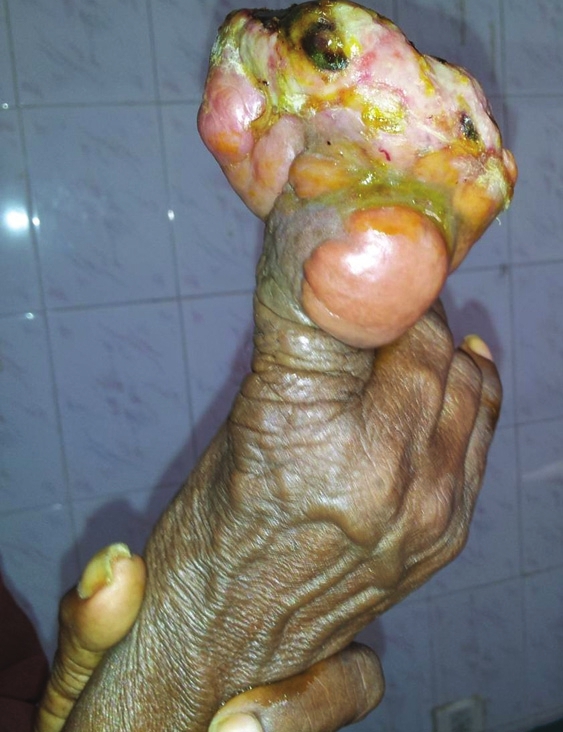 Histoid leprosy is an unusual variant of lepromatous leprosy. The identification of histoid leprosy and differentiation of it from lepromatous leprosy helps to facilitate the follow up of patients with regards to the drug sensitivity, relapse and reaction. We present here the role of FNAC in the diagnosis of histoid leprosy. Giant fibroids are known to arise from the uterus, although very rarely from extra-uterine sites. Among extra-uterine fibroids, broad ligament fibroids generally achieve enormous size and generally present with pressure symptom like bladder and bowel dysfunction. Myxoid degeneration is a rare complication of benign fibroid, where presence of cystic changes mimics the metastatic malignant ovarian tumor. 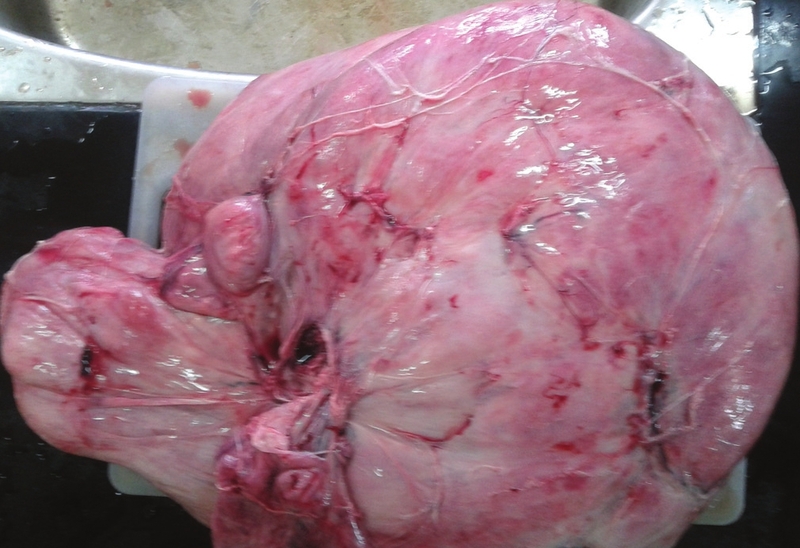 We report a case of true broad ligament fibroid measured about 13 kg. This case is reported for its rarity and the diagnostic difficulties in differentiating malignant ovarian tumor and benign fibroid with myxoid degeneration. Chondrolipoma of the breast is a rare benign mesenchymal tumor composed of mature cartilage and adipose tissue. We present one such case in a 55-year-old woman presenting with left breast lump detected by self-examination. The tumor was diagnosed as fibroadenoma clinically. The diagnosis of chondrolipoma was possible only by histopathological examination. This case is reported because of its rarity in breast. Mucocele of the appendix is a descriptive term that implies a dilated appendiceal lumen caused by abnormal accumulation of mucus. Mucocele is found in 0.2-0.3% of all appendectomy specimens. The male to female ratio is 1:4 and the average age at the time of diagnosis is over 50 years.Appendiceal mucocele can be histologically divided into three groups, focal or diffuse, mucosal hyperplasia without epithelial atypia, mucinous cystadenoma with some degree of epithelial atypia and mucinous cystadenocarcinoma.We report a case of benign mucocele of the appendix, which presented as persistent vomiting and lower abdominal pain. 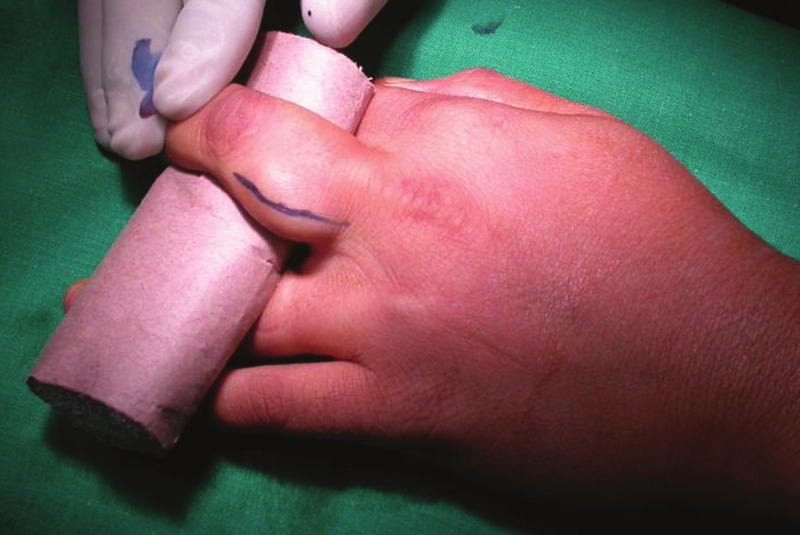 Extra-abdominal desmoid tumour is a rare tumour and involvement of the finger is extremely rare. These are generally non-metastasizing lesion of mesenchymal origin composed of fibrous tissue with locally aggressive proliferative behaviour. We report a case of extra-abdominal desmoid in a sixty year year old lady involving the right index finger. The swelling was slowly increasing in size over a period of eleven years and involved almost the entire length of the finger. A disarticulation at the second metacarpophalangeal joint was done and histopathological examination confirmed it to be a desmoid tumour.